The use of 75GPD and 100GPD membrane is now obsolete. Before, you'd have to sacrifice purity when you want larger capacity, but now you would get larger capacity and higher purity than Dow Filmtec and GE 75GPD membranes. Using our new 150GPD high rejection membranes, we bring you high volume and high purity RO+DI systems. Our 150GPD membranes have achieved 97-98% rejection rate in real-life conditions, not just published values you usually see. Now it comes with 3 clear bottom housing. WaterGeneral Reverse Osmosis+DI Water System Made in USA. 6-stage 150 gal/day Reverse Osmosis Water System+ 2 DI filters (stand alone unit, no drinking faucet, no pressure tank) + Bonus Pressure Gauge. This system is a 6-stage 150 gallon per day reverse osmosis + 2 DI filter system with single outputs (mainly for Aquarium and Reef). We use 2 Nuclear-grade color changing DI filter with refillable Clear housing and DI dispensing ball Valve for applications like Reef, Aquarium, hydroponics, humidifier, jewelry cleaning, any application requiring ultra pure water. Note: 150 gallons per day capacity is the maximum production rate of the system, actual production rate depends on input pressure and temperature. For example, at 70psi and 60 degrees the system makes 120 gallons per day or about 5 gallons per hour. Lower input pressure and temperature would decrease production rate. Tap or well water ---->. Water purity about 300 ppm. The advantages with using clear, refillable DI filter: REFILLABLE means that you can partially refill your DI filter and eliminate the effect of channeling, and increase the usable life of the DI resin 3 times and filters out 3 times more water. Optional Kitchen Faucet Diverter Valve, connects to the aerator of the faucet for easy installation and removable connection to water supply on the counter top , part no. Optional Garden Hose adapter, connects to garden hose or laundry room hose, part no. Optional DI (de-mineralize) Resin Refill, the bag contains 3 refills , or 18 ounce of resin. It is able to process on average about 1600 gallons, part no. Nuclear grade with color indicator: for production of demineralized water of high purity, silica free. When the resin is used up, the color resin will change either from green to dark brown color or from light brown to dark brown / off black color. Depending on the batch supply, the original color ranges from green to light brown. This is common with all suppliers in the industry. It will give you 0 ppm TDS, Conductivity attainable less than 0.1uS/cm or resistivity of close to 18 meg. Color changing GREEN --> BROWN. Stainless steel arm and connector, plastic float. It is very reliable and durable, never breaks. You can choose side-mount, part no. FV-14 or top-mount part no. This system is a complete system ready to be installed. RO+DI unit with All 6 stage , 6 filters (ALL FILTERS ARE STANDARD SIZES). Feed water adapter valve which connects to cold water supply under the sink. When your shut off the dispensing valve or when your own float valve closes, the automatic shut-off valve shuts off the water feed and drain, so prevent wastage of water going to drain. And if you have your own large container and float control valve, this system would turn ON/OFF automatically to refill your container. DI filter dispensing ball valve for your own container. This system is a RO+DI system it connects to the water supply, then it produces water. You need to have your own container to collect the water since the system doesn't come with a tank. Is the preferred partner of Honeywell Inc. We have very knowledgeable tech support & Customer service team if you have questions about this listing. FK-3 which you replace once a year. The DI filter replacement period depends on the water quality of your tap water and how much DI water you are using. This is a complete system with all filters, tubing, feed water adapter, drain saddle valve, installation manual. 1st stage: high capacity, 5 micron sediment filter, to remove sediment, rust, sand, (replace every 12 months). 2nd stage: high capacity carbon filter , coconut shell carbon block filter removes chlorine, taste & odor (replace every 12 months). 3rd stage: high capacity carbon filter, coconut shell carbon block filter further removing chlorine to ensure 100% removal of chlorine (replace every 12 months). 4th stage: US Membrane TFC-150 high rejection membrane : 100% Made in USA, Specially made for high purity applications. Through our own testing using 417ppm and 70psi input tap water, this membrane has better rejection rate than Dow chemical Filmtec 75GPD and GE membranes. 5 th stage: DI filter (de-ionized, de-mineralize filter), Nuclear grade, color changing DI filter with refillable clear housing. The DI filter removes remaining of dissolved solids after RO system. 6th stage: DI filter (de-ionized, de-mineralize filter), Nuclear grade, color changing DI filter with refillable clear housing. A ball valve is included for dispensing DI water into open containers or to open tank. GOOD for reef, aquarium, hydroponics applications. System Dimension: RO unit: 15" length, 16" height, 5.5 depth. The advantages with using clear, refillable DI filter. REFILLABLE means that you can partially refill your DI filter and eliminate the effect of channeling, and increase the usable life of the DI resin 3 times and filters out 3 times more water. All DI filters inline type or cartridge type suffers from channeling effect. DI resin would shrink in size when they are been used. Then some water will pass through the resin without been filtered. Also water will find the easiest way to go through the filter, and that is the channeling effect. This is evident that when you have a new DI filter, it is compact, and it is able to remove lots of mineral, but it gradually looses its performance. This is also evident that after you use the DI filter for a while, you can hear the resin becoming loose when shaking the filter. So the channeling effect of the water and shrinking of the DI resin causes the DI filter to be prematurely tossed away. There are still about 30% good DI resin been toss away. Also the DI filter looses its capability over time. NOW we have a solution to solve this problem by using the clear-refillable DI filter. You can now get constant performance of DI filter, and refill just partially to keep the resin compact inside the housing. Also you are able to re-use the DI resin by re-mixing it. Thus eliminate the channeling effect. Therefore you are able to achieve optimum performance, save 30% of the resin, increase the usable life of the resin, and filter out 3 times more water. The best of all, you can see all this in action in our clear housing. No harmful chemical added: Our resin does not contain chemical that will be harmful to skin, to fish, to reef, to live rock. It will not put any additional chemical into the purified water. Designing consideration for inline DI filter. The ideal shape for the inline DI filter is long and thin like our 2" x 10" clear housing. What's important is to increase the contact time and minimize channeling, and maximize the usage of resin. Larger diameter inline filter like 2.5 wastes more resin and has more channeling problem. Resin that is near the outer diameter are not been used much, and there are more places that will form channeling effects. So the IDEAL and efficient design will be to use two smaller diameter inline filter in series, to achieve contact distance of 20 inches. FREE bonus Pressure Gauge: It's helpful in monitoring. Operating pressure of the RO system. When to replace sediment & carbon filters. 2 DI Filters: Clear, refillable housing. The DI resin we used is the highest grade, nuclear grade mixed-bed resin. It is used in pharmaceuticals, semiconductors, laboratory applications. It is able to achieve the highest purity of 0 ppm (Zero mineral, Zero Silica) and near 18 meg. Now it is available to Aquarium lover and reefer at affordable prices. DI Filter Dispensing Ball Valve is included: We specially include additional ball valve for the DI filter. The output is going to your own container or fish tank. When you shut-off this valve at the output, the automatic shut off valve with turn off the system in about 1 to 2 minutes. You don't need to shut off at the water supply. Just shut off the output valve, system would shut off. Automatic-Shut-Off Valve is included; when you shut off the dispensing valve or when your own float valve closes, the automatic shut-off valve shuts off the water feed and drain, preventing wastage of water going to drain. Feed Water Adapter: for under the sink installation, we give you the adapter with valve to put in between the cold water line. Our adapter has several advantages over the self-piercing valve. Our adapter will not clog up like the needle point piercing valve. Also our adapter does not require putting a hole in the pipe. Also you can easily replace the valve or relocate the valve without changing your piping, unlike the other self-piercing valve, where once it punctures a hole you cannot replace the valve, then you need to replace the pipe and the valve. Clear bottom 3 filter housings. For easy checking of filter condition. We are first company to ever come up with the idea on all clear housing Aquarium RO system. We use a fixed rate flow restrictor to accurately restrict the drain line and create proper working pressure for the operation of the reverse osmosis process. Therefore, a more efficient and favorable pure water to drain ratio is achieved at 1:3. We have abandoned the type of flow restrictor that has a black lever on top for flushing since it is not an accurate flow restrictor. The system flushes itself when it is making water. In most cases a manual flush valve is not required. However, it is beneficial to manually flush the membrane if the water supply is from well or very hard water, above 600 ppm of TDS or Hardness. FRONT VIEW OF THE UNIT. TOP VIEW OF THE UNIT. 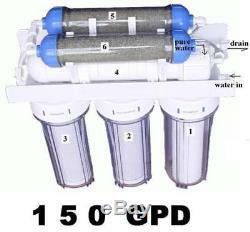 All reverse osmosis systems, residential or commercial, are required to have drain water when making pure water. Our RO systems have built-in auto-shut-off valve so when the storage tank is full, the system shuts off automatically. The ratio of pure water to drain water for our RO systems are 1:3 (calculated). Average RO systems are typically 1:4, so our RO systems run more efficiently. Minimum water pressuer required to operate the system is 45 PSI. Ideal pressure is 85 PSI. This system is intended to be operated with under 400 ppm tap water. If you have higher ppm in the water, the purified result will be affected and we can not guarantee the purification ratio. The item "RD150 AQUARIUM CORAL REEF REVERSE OSMOSIS RO+2 DI WATER FILTER FILTRATION SYSTEM" is in sale since Wednesday, September 7, 2011. This item is in the category "Pet Supplies\Fish & Aquariums\Cleaning & Maintenance". The seller is "filterdirect" and is located in Irvine, California.